What if I don’t ever have to use my preparedness supplies? Then what? I’ve just wasted all that money. And honestly, I get it! It can be hard to invest in preparedness supplies that you may (or may not use) when Johnny needs new shoes TODAY. I’d like to share some good news with you today. 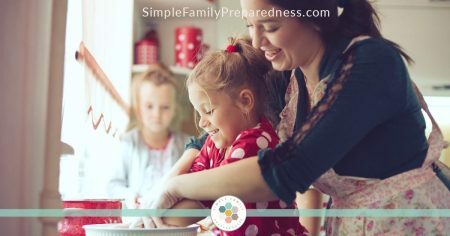 Even if you never face a true disaster or long term job loss, your efforts at getting your family prepared will still be useful. I often make quick, nutritious meals even on busy nights when I can’t get to the store or forget to thaw out the meat (and avoid fast food). I can quickly comfort a hurting child when they skin their knee at the park, without having to go home. I’m safe on the road during a snow storm–even if I get stuck. I can get a hot, home cooked dinner on the table even if the power is out for a few hours. I can run a last minute dinner to a sick friend’s family. I’ve used the Sun Oven or Herc tea light oven as a 2nd oven when I needed to cook multiple things at once for lots of guests. I’ve shared my powerless cooking supplies when the utilities were turned off at a friend’s home who was out of work. I regularly save money by stocking up on food when it’s on sale. Want to Spend Less Time in the Kitchen? Today I want to focus on one specific benefit: saving time in the kitchen. This is my absolute favorite thing about having food storage! I use my food storage almost daily in one way or another. 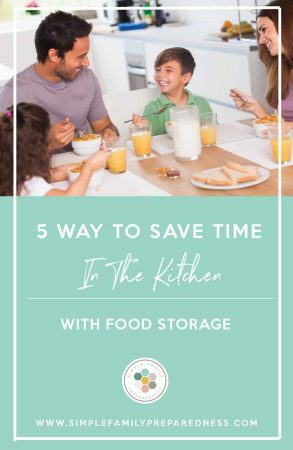 Today I’m going to share with you the five food storage items that save me the most time in the kitchen. I have a lot of meat in our freezer, but sometimes (too often), I forget to pull some out in the morning for dinner that night. Before I had freeze dried meat, that meant I either tried to defrost it in the microwave (and accidentally cook a third of it, which makes it tastes off), or we ate out. Now, I just grab some of my freeze dried meat. That alone is a great benefit–no more fast food (with high cost and poor nutrition). But beyond that, freeze dried meat is simply quicker; in fact sometimes I plan to use it if I know I have a busy night. You don’t have to spend time waiting for it to defrost. You don’t have to spend time cooking it. You don’t have to spend time shredding it. You don’t have to spend time cleaning up the pan you cooked it in or the strainer you used to drain off the fat. It hydrates in warm water in just 10 minutes. I usually add some bouillon or other seasoning with the water and then work on other parts of the meal as it just sits and hydrates all on it’s own. It’s pretty awesome sauce. Raise your hand if you like washing, peeling, and chopping up veggies for dinner. What? No one? Well, no one with small kids at least. They are all over you while you try to make dinner. When it comes to making dinner, the quicker the better, and washing, peeling and chopping isn’t quick. Freeze dried veggies are already washed, peeled, and chopped. For this reason, they work REALLY well in soups–just toss them in the pot and go! They also work in casseroles or even stir fry. 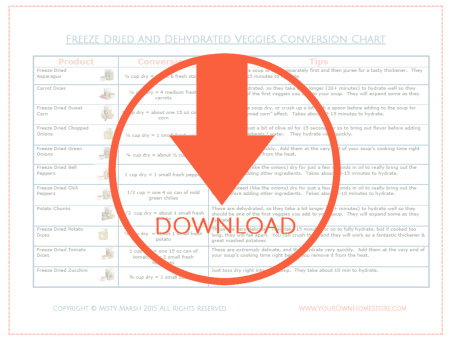 I do have my favorites though, and I’ve complied them all for you on this handy-dandy printable chart that will help you convert fresh to freeze dried as well! Just click HERE or on the image below to download it. I love beans. My husband and most of my kids do not. This means that if we open a can of beans for dinner one night, half of it will go bad and get tossed before we get back to it again. So, I tried cooking up dry beans for a while. But THEY. TAKE. SO. MUCH. TIME: filter through them and pick out all the rocks and other junk. Wash them, soak them. Cook them. They are delicious, but it’s a big time investment. I found instant beans a few years back and they have changed my life (well, that is a bit of an exaggeration, but I am eating a lot more beans since I found them). I can cook up just what my one son and I will eat in just 10 minutes! No waste and super quick. There are four base french mother sauces that are used to create all other sauces: Tomato, Bechamel, Veloute, and Espagnole. Unfortunately, they can take a bit of time (and skill) to whip up. Luckily, Chef Todd (THRIVE Life’s professional chef) spent a year developing these four sauces in a “just add water” form! And they are amazing! I was a bit skeptical at first thinking that they just couldn’t be as good as a made from scratch sauce, but man alive! They are actually really good and easy to use. My favorite is the Bechamel. I use it multiple times a week. I also use the Veloute and Espagnole pretty regularly, but I prefer the tomato powder to the tomato sauce. I love to bake, and sometimes I don’t mind the time it takes. I enjoy working with just one kid at a time in the kitchen baking bread or creating some yummy treat. But the honest truth is that those moments are more rare than common. Most of the time, I just want/need to get something made fast. Bakery mixes where I just have to add water, or water & yeast, or water & butter etc. are fast! I can quickly whip up brownies or cookies for a neighbor, dinner rolls, cornbread or pizza dough for dinner, or whole grain pancakes for breakfast. You can find my favorite bakery mixes HERE. So there you have it! 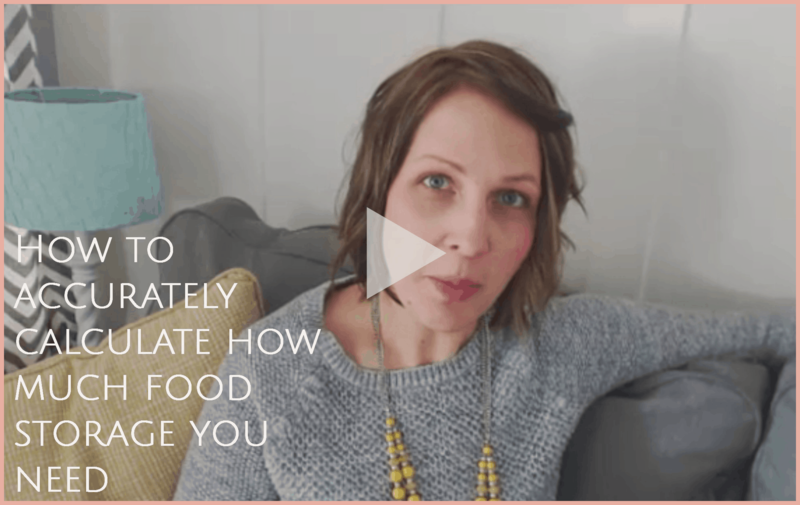 Having food storage in my home regularly saves me time in the kitchen without sacrificing nutrition or taste. Do you have a favorite time-saving food storage item? I’m wondering what the shelf life of freeze dried fruits and vegetables after they are opened. About a year Kaylene. If it is really humid where you are, maybe closer to 6 months! Love your ideas. All so practical. I figure if I live long enough and food prices go crazy due to world wide issues.. I have food. Or my children do. Or if I don’t live long enough, the kids can donate it to,our local Mormon church. Any way you look at it… nothing will be wasted.